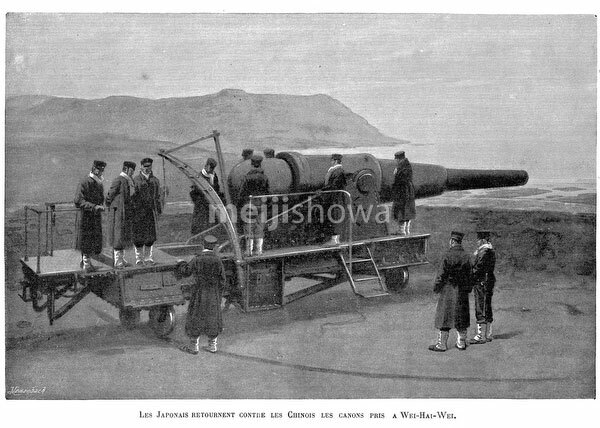 Japanese imperial troops use a conquered gun emplacement at Weihai, Shandong Province in China against Chinese forces during the First Sino-Japanese War (1894–1895). The Battle of Weihaiwei (Japanese: 威海衛の戦い, Ikaiei-no-tatakai) took place between January 20 and February 12, 1895 (Meiji 28). Published in the French illustrated weekly Le Monde illustré on March 9, 1895 (Meiji 28).